respect to endurance, density, stability or aspect. resistant compared to the middle layers, is transparent, durable and resistant to scratches. The second layer has a decorative purpose. It reproduces a highly detailed image, simulating the appearance of different types of materials. Hence, through this layer, the laminate flooring can take the aspect and color of various wooden flooring (as oak, cherry tree beech wood and so forth). The third layer of the flooring is the most thick of all and consists of the fiberboard core. It’s purpose is to provide stability. Finally, the bottom layer is toughened as to increase the protection against moisture and to provide stability. of a neat and steady aspect of the flooring depends a lot on the quality of this top layer. I’ll get to this later. Right now it’s worth mentioning that even if you’re not a flooring specialist, if you think about buying some laminate flooring, it would be a good idea for you inspect directly the products, to conceive of their quality. Online, all laminate flooring might look the same, but the differences in quality are easier to grasp in real life. Also, don’t hesitate to ask the supplier about the materials used and the about the reasons for price differences between various models. Of particular importance is whether the top layer was treated with a moisture- protective substance. Singapore offer installing services, but you could even install it by yourself. Also, the laminate flooring is pretty long- lasting and resistant to scratches. It is cheaper than wooden flooring and also very versatile, simulating many styles of flooring for a lower price. As for the cleaning and the maintenance of the laminate flooring, this is not a hard thing to do, but there a few things to consider. First, keeping the laminate flooring clean is very important, as the dust or the dirt particles might scratch the surface over time. Meanwhile, the manufactures recommend to scarcely use the water for cleaning the laminate. 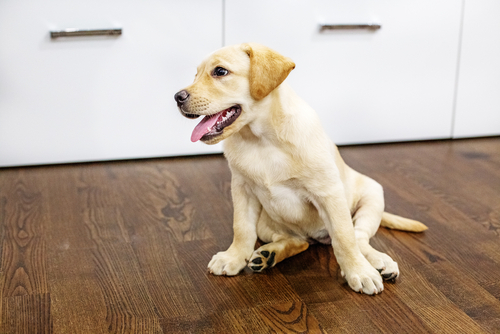 This is one of the most important rules to remember when it comes to the maintenance of laminate flooring: to protect it as much as possible from moisture. The reason is that water can infiltrate through the protective layer (especially if it’s one of inferior quality) and through the spaces between the tiles. When water reaches the lower layers, mainly the fiberboard core, it causes the planks to swell. In time, this will lead to the loss of the plain aspect of the tiles and to the appearance of some unsightly bumps. That’s the reason why most manufactures won’t recommend you to use laminate flooring for the kitchen floor, as it is hard to avoid it’s exposure to water. 1. 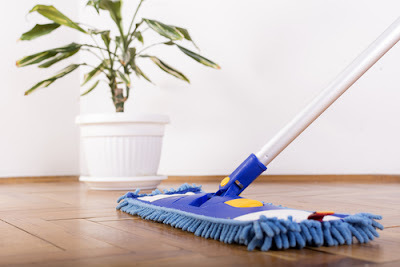 For the regular care, the manufacturers recommend you to use a dust mop, a soft bristle broom or a vacuum cleaner to remove the dust particles and the dirt. 2. Damp cleaning should be done only when necessary. You can use here and there some water, only along with a very highly absorbing mop, to soak up the moisture right away. laminate cleaning. There are, for example some cleaning products that you have to spray onto a cotton, terrycloth or microfiber mop and use it to remove the dust deposited on the laminate flooring. 3. When cleaning the flooring, also pay attention to the potential mechanical or chemical damages. In this regard, avoid using any kind of abrasive or corrosive material. Avoid the use of harsh materials for cleaning the floor and also be cautious when using soaps or any kind of chemical substances. Some soaps might also make the flooring slippery, increasing the risk of accidents. climate, there are some things to consider in order to protect the laminate flooring. For one thing, it’s obvious that laminate flooring is not suitable for outdoor spaces. Also, during the rainy days you might pay attention to the spaces near the windows or balconies. Through a opened window, for example, the rain could get in and moisten the floor. Anyway, it’s advisable to use periodically a dry mop to clean the dirt and to soak in the moisture. the bright sunlight. In order to protect the flooring from sunlight, it’s advisable to use some window coverings. Not all the day long, of course. Only do your best to avoid the useless sunlight exposure. Also, some manufacturers recommend that you change now and then the arrangement of the furniture so that the flooring suffers the same deterioration due to environmental conditions, over time. 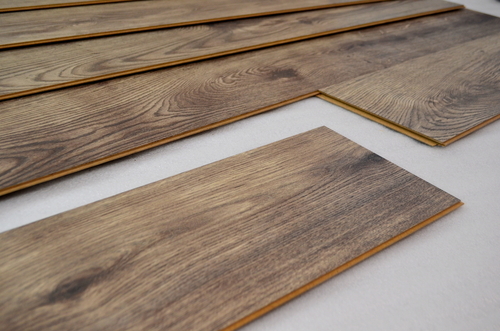 In summary, laminate flooring has a lot of advantages, surpassing its weak points. I hope you’ll put all this information to good use in order to enjoy the neat and clean aspect of your flooring for long time.